No modern medical marvel nor one’s overriding faith in religious philosophy can heal wounds, both mental and physical, as much as music can. Music has brought communities together, developed relations and better, sown seeds of trust among a species who are more inclined to breed hostility. We metalheads ought to know better, for there is no better example of a community more tightly knit than ours. Today Raj Sharma catches up with British lecturer/journalist Ray Holroyd who runs his own record label Revolution Harmony, with the sole intend to help talented artists come up and in the same vein, help the world to be a better place, in his own little way. The profits of the label are channeled directly to charity. There is nothing but massive respect for the dude from our side. Here is the interview where he talks about the new single from Revolution Harmony featuring an all start cast. Head down and see for yourself who they are..
1. Greetings Ray, the main motive of Revolution Harmony is finally getting started with the Release of We are?? When and what exactly was it that motivated you to lead such a good cause?? Firstly, thank you so much for your kind words and support, I’m deeply grateful. To answer your question, I feel that my motivation to make a positive change in the world started at a very young age, though I didn’t have the resources to materialise my empathy into something like Revolution Harmony until fairly recently. Most people are only finding out about me now, but it has taken almost three decades of practicing, studying, and networking to lay the foundation on which I could build Revolution Harmony. Growing up in South Africa, I saw first-hand how unimaginably difficult life was for people in the townships, like Khayelitsha that was down the road from me. I was beyond fortunate to have had the opportunity to study and play music as a child. Music has the power to literally save lives, and all children should have access to music education, especially those in underprivileged areas. 2. The single is dedicated to Nelson Mandela and the memory of Lucky Dube , any particular reasons behind it ?? As a South African who lived through the apartheid years, I found Nelson Mandela and Lucky Dube to be unwavering in their visionary work to heal the country’s horrific wounds, and move everyone away from the violent black/white past and into the peaceful rainbow-nation future. Thankfully everyone knows about Mandela, but not many people outside of South Africa are familiar with Lucky Dube, which is why I wanted to bring awareness to him and his music. He was a truly inspirational revolutionary and a phenomenally talented musician, like our very own Bob Marley. However, the whole country wept in October 2007 when he was sadly shot dead, which was definitely one of South Africa’s greatest losses. Both Mandela and Dube have inspired me and countless others, by proving that one person truly can make the world a better place. Imagine a world where everyone felt empowered like them to make a difference! 3. Do you intend to do more of such Charity single as “We are” in future or you have anything else planned after this release?? Yes, definitely! In fact, I’m working on our second All-Star charity single right now and I’ve already confirmed two artists for it. I’m aiming to release the next single at Christmas, and my goal is to do three or four every year after that. All the proceeds from each single will go to a different smaller charity. This was my ultimate dream team for our debut single! However, there are two really soft sections in the song that needed a female voice, so my friend Stefan Loh (We Claimed Sentience Once) who also played guitar on the track, recommended a friend of his called Abbie Johnson. As soon as I heard Abbie’s unique vocals I knew she was the only one for these parts, so I got her on board right away. I also love how the single features a Grammy winner but also a young unknown singer, though hopefully she won’t be unknown for much longer! This is an idea I will be repeating on every single too. 5. As quoted by Serj , the song structure seems to be“ intertwining genres and vibes”, what is your take on it ?? Haha, it’s a difficult song to describe, but I’ll try. It’s a dark six-and-a-half minute epic, with captivating vocal melodies/harmonies and unusual instrumentation, as there are piano and trumpet playing alongside heavy guitars and beautiful strings! 6. “We are” is Composed, arranged, programmed by you, it seem Ihsahn is only doing vocals not guitars along with Serj, this surely is a crazy collaboration on the vocals how did you came up with that ? My musical goal with these All-Star charity singles is to create collaborations that nobody would ever expect. These rare line-ups get everyone talking, and therefore raise awareness of our causes and the charities. I wanted to match two singers from extremely contrasting musical backgrounds, which I could hear in my head singing perfectly together. I’ve been a loyal fan of both Serj and Ihsahn since the ’90s, and I know everyone is going to be amazed when they hear how well their voices work together! 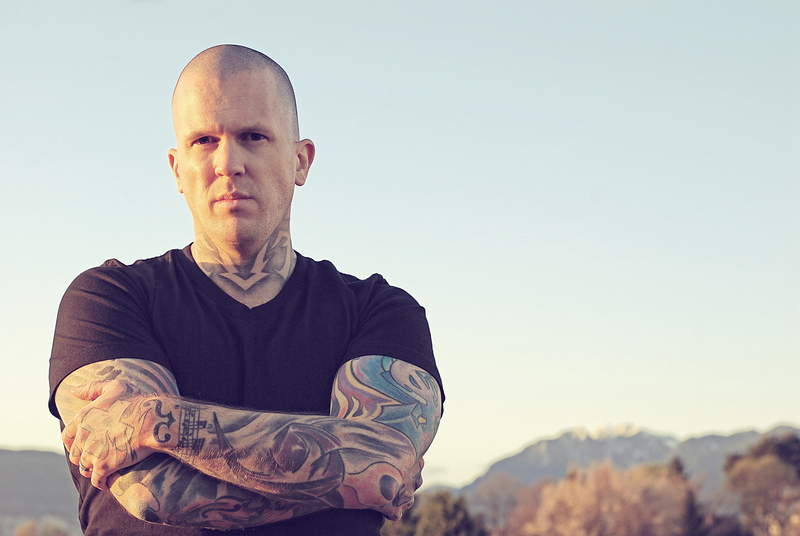 7.Coming on to production, the song is going to be mixed by Rohan Onraet (Slipknot, Machine Head) in London, and mastered by Ted Jensen (Green Day, Muse) in New York. What makes you get them on these duties? Rohan is actually an old friend of mine from Cape Town, we grew up together, and he ended up moving to London and becoming a successful recording/mixing engineer, so we started working together back in 2001 when I relocated to London. With regards to Ted, so many of my favourite albums are mastered by him, so it was a no-brainer when it came to choosing the mastering engineer. 8.Your first milestone for Revolution Harmony, and to share it with three of your musical heroes, Serj, Ihsahn and Devin?? How do you feel about it, knowing that such great musicians totally supporting your vision by getting involved in this charity release? To be honest, I’m still in complete shock, haha! Everyone always talks about how selfish and cut-throat the music industry is, and for the most part I do agree, but, there are also a lot of wonderfully kind and compassionate artists out there who are dedicated to good causes and giving back. Having the support of these three heroes of mine has left me overflowing with gratitude and hope. 9. All three of them have worked in a different genre mostly , was it easy convincing them to work along together? Yeah it was. I actually had a whole speech ready to go in order to convince them of why it was a great idea, but I never even had to use it, haha! 10. Thanks for your time, Any last words for the readers?? 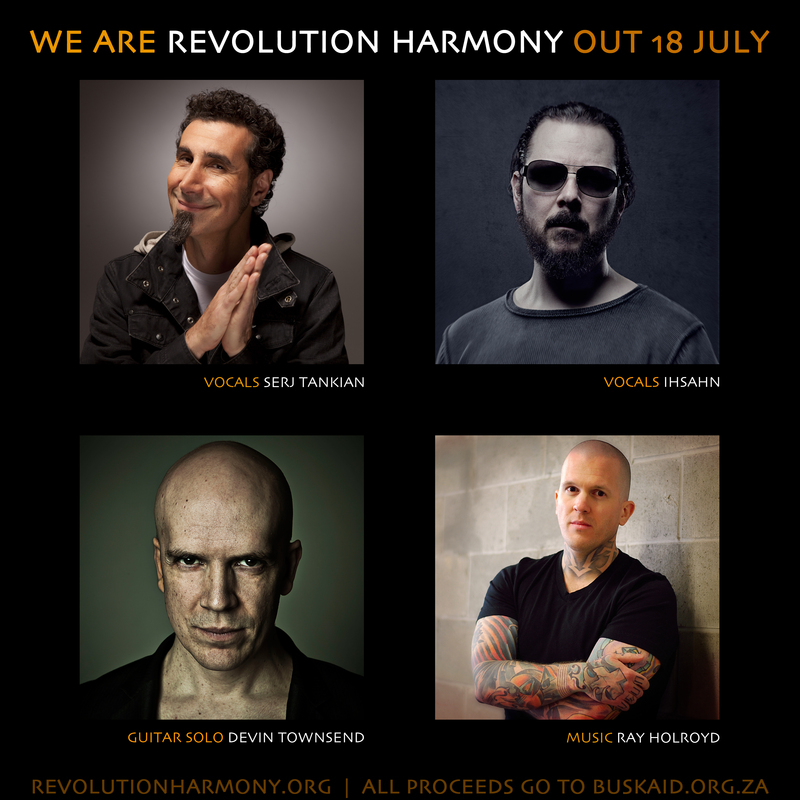 Revolution Harmony’s single “We are” will be officially out on July 18.